Anybody who has been to Turkey knows that meal times are a central part of the day. Whether you are a local, a resident or a visitor, your free time will centre around your next delicious meal. Being one of the most thriving cities on the southwest coast of Turkey, Fethiye has become well known for its delicious eateries. With stunning agricultural land in one direction, organic produce is as fresh to the plate as the local chicken and beef, while the turquoise sea in the other direction offers the most incredible seafood which has made Fethiye’s fish market one of the best in the world. If you have joined us looking to invest in Fethiye apartments or you own a villa in Fethiye’s surrounding area, you will be very glad to know that every favourite traditional Turkish dish can be found in Fethiye. 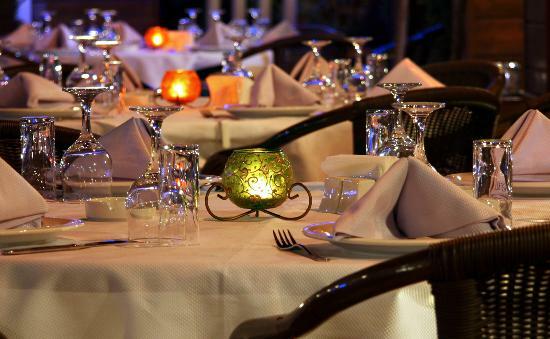 You will find all of our top ten restaurants in Fethiye easy to reach from your very own property! Fethiye Fish Market is one of the city’s most famous tourist attractions, popular for a night out and as a lunching spot for locals. Located in the old part of town, you truly have to love seafood to enjoy the market as you can smell it before you see it. Set in an off-road courtyard surrounded by traditional shops and restaurants, the fish market stalls are packed full on a daily basis with seasonal treats such as hamsi (anchovies) and barbun (Mediterranean red snapper), but you can find pretty much any kind of sea food here including oysters, king prawns and octopus! 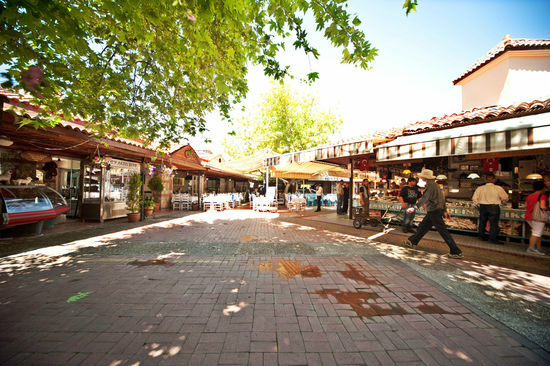 The wonderful Balık Pazarı was once just a simple market that sold fish but several years ago the forward thinking mayor of Fethiye had the rather bright idea to surround the market stalls with restaurants who could offer you the opportunity to enjoy your fresh food right there and then. Of course, you can take your fish home with you if you want to, but for a small fee of just a few Turkish Lira, you can ask one of the local chefs to cook your fish for you ready to eat. Order bread, meze and salad from the waiter and you have a stunning meal to enjoy while watching the hustle and bustle of this world famous market. In high season you will also be able to enjoy the work of local musicians who will entertain you while you enjoy your delicious meal. Some of the fishmongers may point you in the direction of their friend’s restaurant but you are under no obligation to follow his recommendation and may choose any of the surrounding restaurants. There is not much to distinguish them from each other with prices being the same across the board, however we recommend family owned ‘Himli et Balık Restaurant’ for beautiful mezes with your cooked fish. A meal at the Fethiye Fish Market is one of the must-do activities to experience in Fethiye! If you are looking for a quick fast food fix in Fethiye, don’t be distracted by the golden arches of McDonalds, opt for a local establishment! While you can find American fast food joints such as McDonalds, Burger King and even a Domino’s Pizza in Fethiye, you will find healthier and more interesting options at this wonderful kebab restaurant located at the Fish Market. Swap burgers for döner kebap and pizza for pide and not only will you contribute to the local economy rather than an American corporation but you will get more meat and flavour for your Turkish lira and much fresher food! 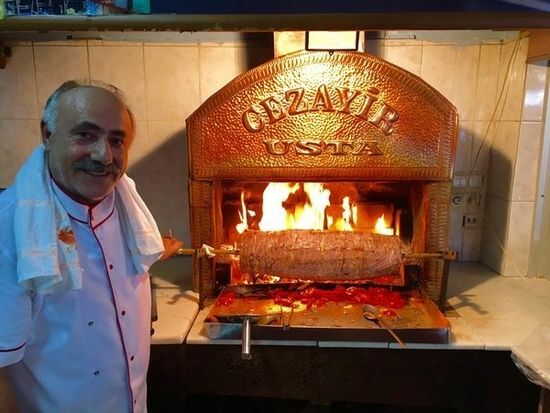 The menu at Cezayir Usta Döner will not disappoint with several delicious options for meat lovers, fish eaters and vegetarians. The ultimate fast food option is the kebab, the döner (chicken, beef or lamb cooked on a vertical rotisserie) is a firm favourite with the locals but you’ll have to get there early before they run out! 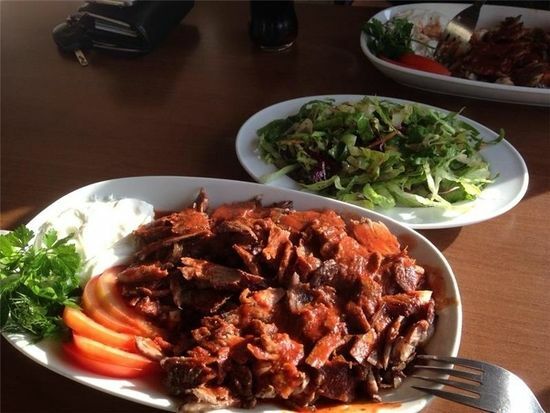 Other fantastic options for kebabs include the Adana kebab (minced meat with chilli cooked on a skewer), Iskender kebab (grilled lamb and tomato sauce) and the mouth watering Köfte Ekmek, meatballs and salad in bread. Vegetarians can pick up some tasty sweet corn which is either boiled or grilled and most likely picked from local fields that morning. For the choice of a savoury or sweet treat, why not try some home made gözleme (pancakes), cooked right in front of you with your choice of filling. If you have bought fish from the market, why not ask the chef to cook it up for you and serve it in some crusty bread to make the freshest balık ekmek (fish sandwich) of your life?? Or if pizza was on your radar, opt for the Turkish version, pide. You can choose between a meat option, a cheese option or you can combine the two. This wonderful restaurant located just one block from the fish market, just behind Domino’s Pizza, is named so due to its eclectic menu which combines the many cultures of cuisine that can be found in eastern Turkey. The chef here takes inspiration from the Hatay region of Turkey which celebrates a mixture of cultures and religions, Muslim, Christian and Jewish, therefore the food from Hatay offers a great deal of variety. The owner describes his menu as a mosaic of dishes! You can find all of the standard meze dishes here that you will find all over Fethiye, but the chef also likes to throw in a few extras that no other restaurant in Fethiye serves; food that is significant in the Hatay region. 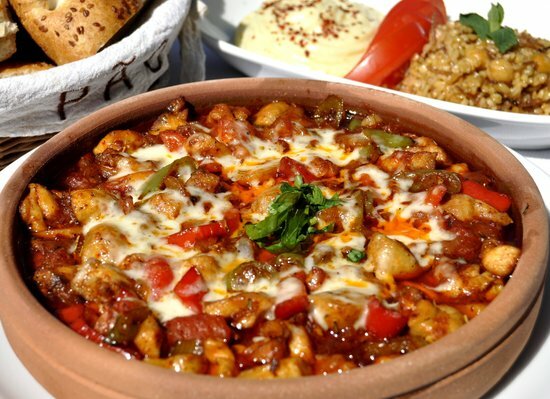 Food traditionally from eastern Turkey is always a little spicier that adds a wonderful kick to any mealtime. Chef Doğan and his team also specialise in regional breads which can be enjoyed with their mixed meze platters. Mozaik Bahçe is the perfect choice for something a little bit different in Fethiye. Set off the main track but still in downtown Fethiye, this interesting little restaurant also has a shady garden where you can enjoy your meal alfresco in the summer months. But one of the best things about this place is the enthusiastic chef who would happily talk to you all night about the food of Hatay and the dishes that you have chosen to eat. Sovalye Island just a short water taxi ride from Fethiye and with no roads or vehicles on the island, offers visitors the experience of spending some time on an exclusive private island. Sovalye is home to some of the most impressive homes in the area and to the Ada Restaurant and Beach Club where you can relax, eat and drink by day or by night. If you are only venturing over there for dinner, the restaurant offers a complimentary boat service which will collect you from the Şat Peninsula and drop you at the Ada’s private harbour. The setting is incredibly romantic and your meal can be enjoyed on the rooftop terrace which offers panoramic views of Fethiye Çaliş Beach and Red Island. It is the perfect spot in Fethiye to enjoy the Turkish sunset with some really excellent food. For some mouthwatering fresh fish away from the fish market, look no further than Arena Restaurant. While the market may have the quirk of being able to buy your own fish, Arena Restaurant offers some of the best views over the Fethiye Marina and across to Palm Island. The establishment has an upper open terrace from which you can enjoy these stunning views while enjoying your meal though there is a main dining room indoors if the evenings should catch a chill. The menu offers beautiful fresh sea food, meat and poultry in traditional and international styles. Perhaps the closest thing Fethiye gets to a chain restaurant, the Meğri team have a couple of restaurants dotted around town. The Meğri Lokantasi is a traditional Turkish Lokanta with something for everyone and a fantastic choice of traditional Turkish fare. In addition to a standard Turkish menu, pasta dishes and risotto are also available. Just around the corner is the Meğri Restaurant which offers a more international flavour and has a beautiful garden setting surrounded by plant life and vines. Both establishments are considered to be highly regarded in Fethiye and we doubt you could go too wrong at either! Located on the main road through Calis which leads down to the promenade by the beach, Barbella Restaurant is considered one of the best on the beach resort side of Fethiye. As with most of the restaurants on the tourist trail, the menu is large, varied and competitively priced. You can order anything from traditional Turkish kebabs to Mexican chicken and a good chunk of steak. 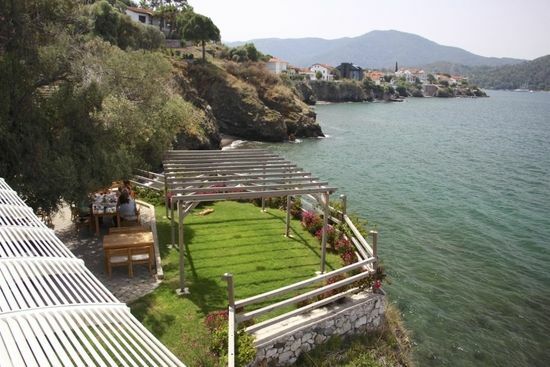 The vegetarian options are said to be some of the best in Fethiye too! When you visit Barbella, you can choose between a selection of set menus, allowing you to enjoy a selection of what they have on offer, or you can order off menu. The set menus are fantastic value for money, costing just less than £7 for a three course meal before drinks. What really sets this place apart is the quality and great value of the food and the excellent service. For something a little different, you can enjoy a wonderful Turkish barbecue cooked in front of your very eyes while enjoying the delights that Fethiye Bay has to offer from the deck of your very own boat. Fethiye Tours offer a fantastic evening boat trip which allows you to enjoy the wonderful Mediterranean coastline of Turkey from the sea, surrounded by stunning islands. The trip is a casual affair where you can experience a swim around some of the clearest waters around while watching one of Turkey’s stunning sunsets. Your host and boat captain will cook your dinner for you to enjoy under the stars as you gaze upon Fethiye by night before returning to the city for a nightcap at one of the lively bars on the marina. 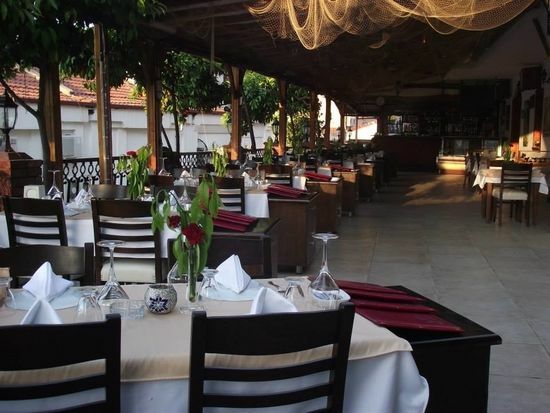 The choice of Turkish restaurants and local dishes can be a little overwhelming as there is so much choice. If you want to break away from the traditional, why not head down to Calis Beach and enjoy a little piece of home at EJ’s Café? 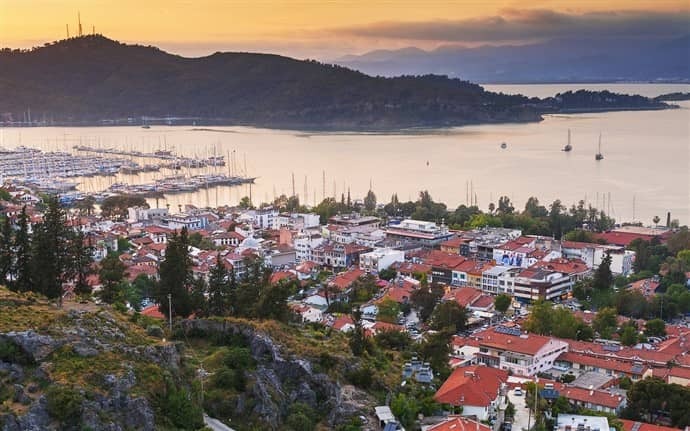 Owned and run by a Turkish man and his British wife, this little slice of Britain has been a huge hits with the expats who have bought apartments in Fethiye. 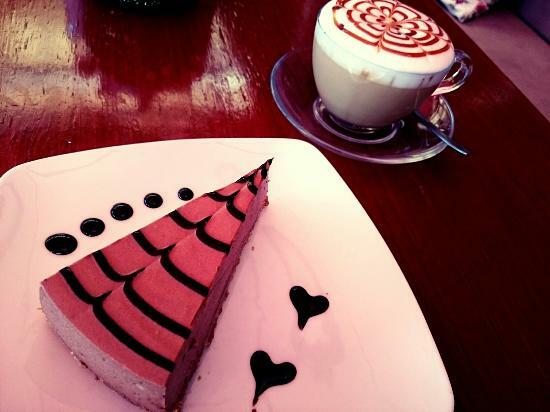 I am sure you can find anything your heart desires on their menu, from burgers and chips to chicken sandwiches and from apple crumble to strawberry cheesecake. They even offer a full Sunday lunch on a regular basis. A selection of meat and vegetarian pies are often available to eat in or takeaway, freshly made on the day. They also make a delicious selection of cakes each day, including gooey cinnamon rolls, the perfect treat with a nice cup of tea by the beach. EJ’s Café also offer a delivery service if you want to spend a night at home but don’t have the energy to cook! Surely every great meal has to end with a great desert and when in Turkey, you should do as the Turkish do and enjoy a portion of delicious baklava with a side serving of dondurma, turkish ice cream. Those in Fethiye will strike gold at the Gaziantep Ulaşlıoğlu Baklavaları, one of the best places to buy baklava on the Mediterranean coast. Gaziantep is the gastronomic centre of Turkey and where baklava was invented, made even more mouthwatering by the fact that local recipes use local produced pistachios in their sweet creations. This place is incredibly chic and offers a flavour of southeast Turkey from the moment you enter the front door. The shop is generously decorated with copper pans and leather goods making you feel as though you had been transported to another world as you order your sweet treats. The baklava is made fresh and it is the best place in Fethiye to try mastic ice cream, an ingredient which makes it resistant to melting! Did you know that we currently have some amazing Fethiye apartments for sale at Turkey Homes? We also have a fantastic selection of Fethiye villas for sale with properties ranging from £40,000 to to £2 million in all of the fantastic areas around the city including Hisarönü and Ovacık and the exclusive Sovalye Island. Why not take a look at these fantastic Fethiye properties and send us an enquiry for more information?